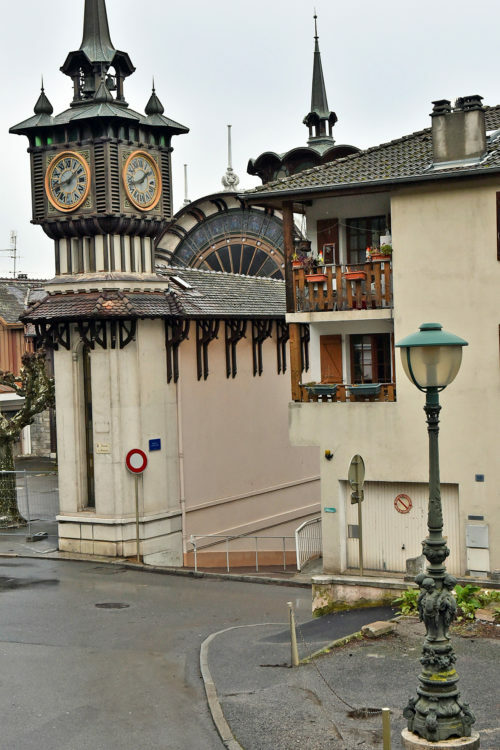 On the southern shore of Lake Geneva, the pretty French belle époque town of Évian-les-Bains, an hour away from Switzerland’s Geneva, offers slow walks along the promenade and healing treatments with therapeutic Évian water. For SAA Sawubona. At Source Cachat, in the spa town of Évian-les Bains, I’m standing in a queue of tourists and locals, armed with an empty bottle. The magnificent stained glass panes of the art-nouveau masterpiece, the Buvette Cachat, the pump room across the street twinkles in the dull winter light. From the single tap against a pale pink-and-white colonnade with shimmery mosaics, water spurts mineral-rich and is said to trickle over 15 years through the strata of the flanking Chablais Mountains. After my turn, I sip on cool and refreshing Évian water, the sort that’s sold in the bottles you find across some 143 countries. 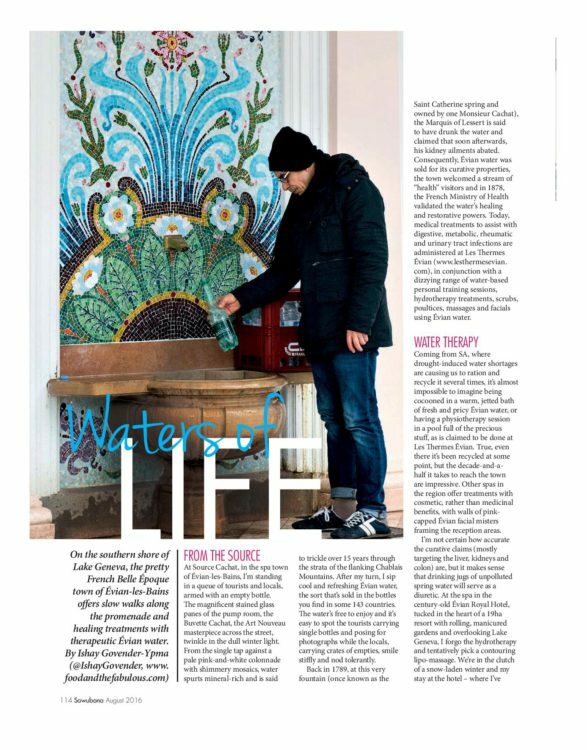 The water is free to enjoy and it’s easy to spot the tourists carrying single bottles and posing for photographs while the locals, carrying crates of empties, smile stiffly and nod tolerantly. Back in 1789, at this very fountain once known as the Saint Catherine spring and then owned by one M. Cachat, the Marquis of Lessert is said to have drank the water and claimed that soon after his kidney ailments abated. Consequently, Évian water was sold for it curative properties, the town welcomed a stream of “health” visitors and in 1878, the French Ministry of Health validated the water’s healing and restorative powers. Today, medical treatments to assist with digestive, metabolic, rheumatic and urinary tract infections are administered at Les Thermes Évian (www.lesthermesevian.com), in conjunction with a dizzying range of water-based personal training sessions, hydrotherapy treatments, scrubs, poultices, massages and facials using Évian water. Coming from a country that struggles with water shortages and where water is portioned out and recycled several-fold, it’s almost impossible to imagine being cocooned in a warm, jetted bath of fresh and pricey Évian water or having a physiotherapy session in a pool full of the precious stuff, as it is claimed to be done at Les Thermes Évian. Even so, all the water used has been recycled at some point, but the 15 years it takes Évian to get ready is impressive. Other spas in the region offer treatments with cosmetic rather than medicinal benefits, with walls of pink-capped Évian facial misters framing the reception areas. I’m not certain how accurate the medical curative claims are – mostly targeting the liver, kidney and colon, but it makes sense that drinking jugs of unpolluted spring water will serve as a diuretic. At the spa at the grand century-old Évian Royal Hotel where I’m staying, tucked in the heart of a 19-hectare resort with rolling manicured gardens, and overlooking Lake Geneva, I forgo the hydrotherapy and tentatively pick a contouring lipo-massage. We’re in the clutch of a snow-laden winter and lengthy multi-course meals, glasses of red wine and fireplace lounging have taken their toll. During the treatment, the therapist works with firm, vigorous movements along my limbs, targeting the lymph glands to aid drainage of toxins and fatty deposits, and massaging my stomach and torso for an uncomfortably long period. Instead of feeling lighter afterwards, my tummy protests and a post-massage tea made with Évian offers no solace. I stick to a facial and a back massage in the days to follow and mist my face and décolletage with the complimentary Évian facial spray in my room each morning. 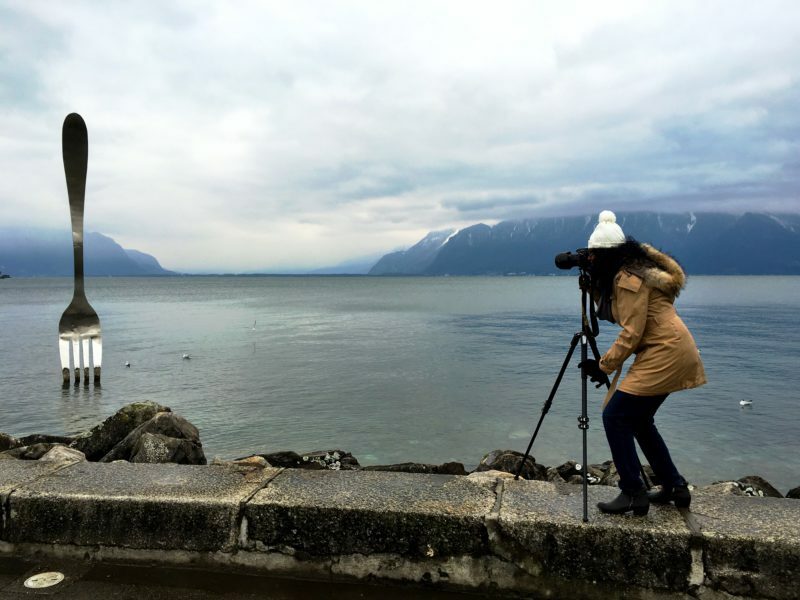 Strolling in the crisp early afternoon along the lake, Lac Léman as Lake Geneva is known in French, is refreshing, and a sneaky way to observe the locals. Young and old, joggers and jaywalkers enjoy the cool air and flowerbeds along the way. Pleasure boat cruises that run in the warmer months and a ferry to Lausanne, are easy to catch from here. Across from the lagoon, period buildings swirl like meringues in pastel hues dotted along the main street – the neoclassical Palais Lumiere which serves as a conference centre now, the theatre and grand domed casino – reminders of the Belle Époque era, the golden age of arts, culture and technology that emerged after the devastation of World War I. I imagine the Dukes of Savoy walking from 19 Rue Nationale to the cobbled, inner-city paths, uphill to the funicular [free, but only operational in spring and summer], between the skinny, stately buildings, pausing for a moment in the quiet residential streets, stopping for an aperitif and a cigarette on the square. 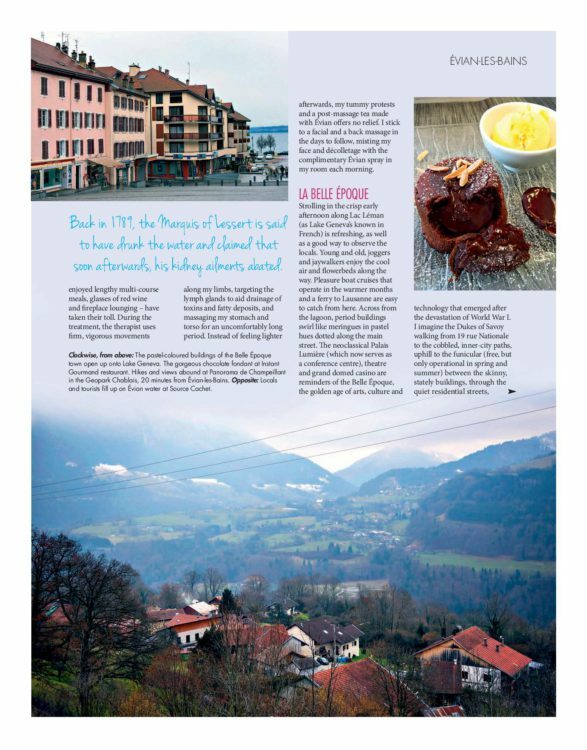 While Évain-les-Bains has long attracted the wealthy, I eat one of the least expensive meals of my three weeks in the Haute-Savoie region, here. Packed to capacity, the meal at the 18-seater Instant Gourmand is very good. For €17, I’m offered the lunch set menu: a slice of frittata with home-made sausage, rich beef ragu on silky pappardelle noodles, gooey dark chocolate fondant and a carafe of wine. 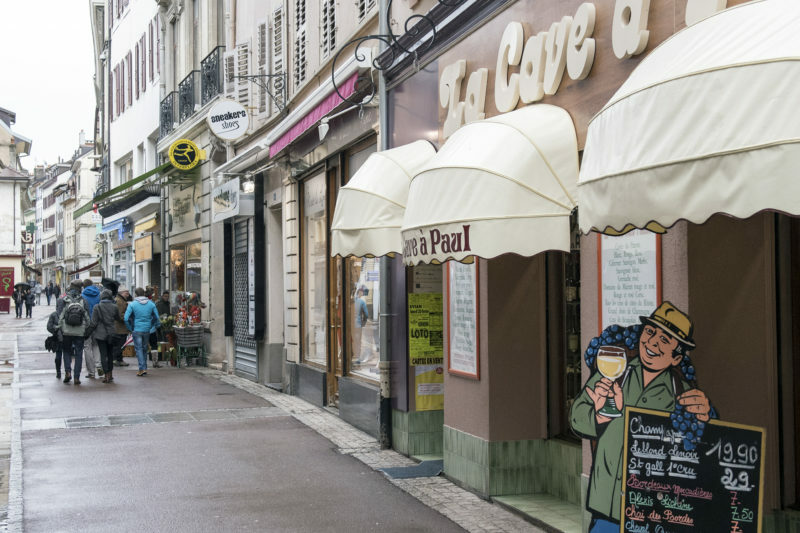 I opt for tap water at most restaurants here – there are a number of sources of Évian across the city, and the municipal water doesn’t taste much different to my palate. 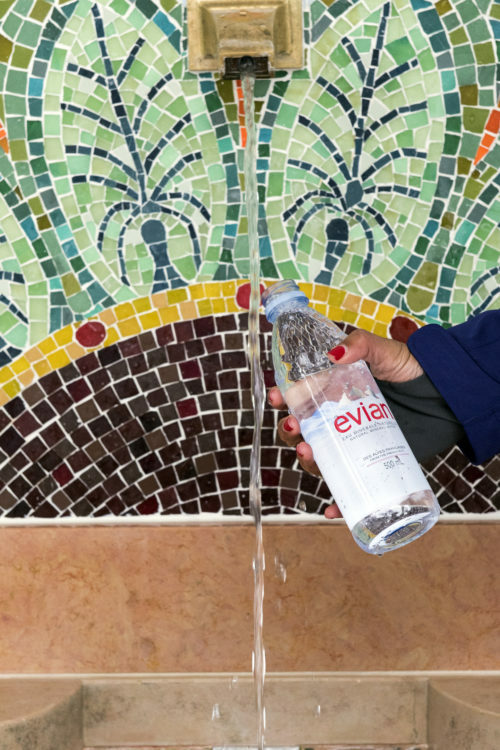 On the drive out to Geneva airport, I fill a few bottles with Évian for the road – after all, why should I pay Swiss francs for the world’s most famous water, when I can actually get it, joyfully, for free. South Africans require a visa for France, and a multi-entry Schengen will get you access to France and the nearby Swiss towns. Book Évian-based treatments Les Thermes Évian, Place de la Libération, 0033 4 50 75 02 30, lesthermesevian.com. 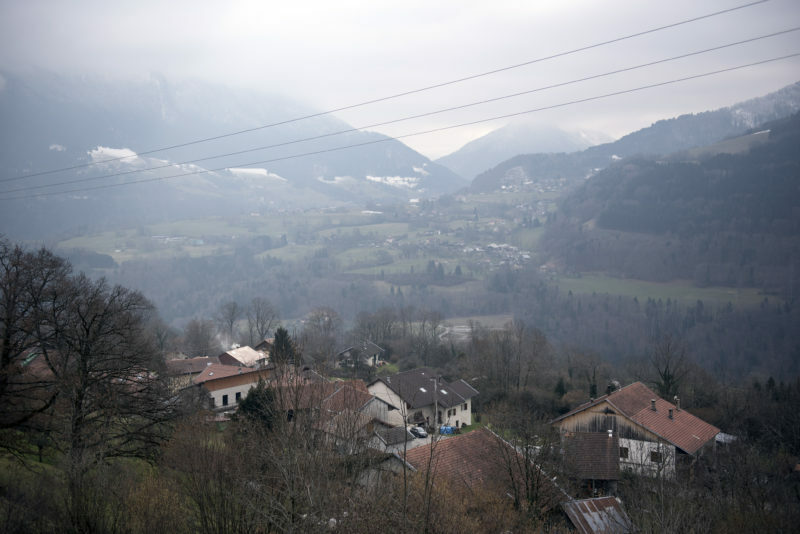 A 20-minute drive from Évian-les-Bains, through smallholdings and past simple farmhouses, there are good hikes and pretty views at the Panorama de Champeillant in the Chablais geo-park. 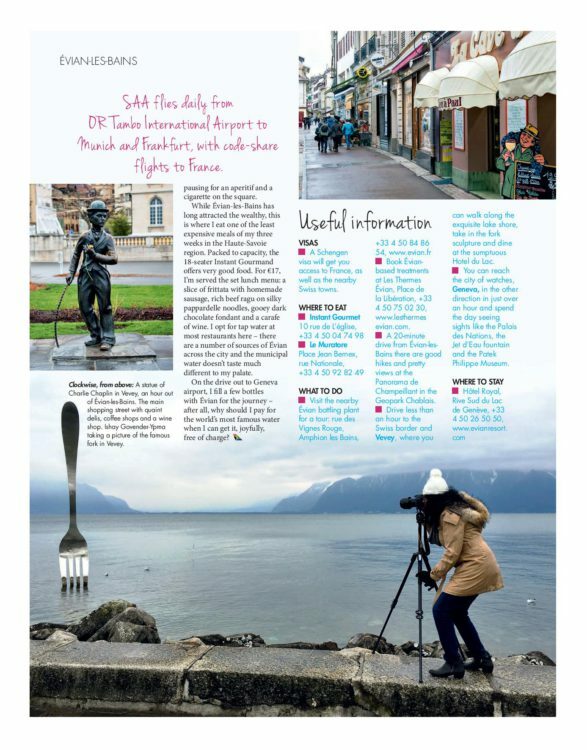 Drive under an hour to the Swiss border to Vevey, where you can walk along the exquisite lake, take in the fork sculpture and dine at the sumptuous Hotel du Lac. You can get to the city of the watches, Geneva in the other direction, in just over an hour and spend the day touring the sights like the Palais de Nations, the Jet d’Eau fountain and the Patek Phillipe Museum.